Plastic bags have become a staple of consumerism in the US, as well as an everyday convenience worldwide, since the 1970s. But the environmental impact directly related to these grocery/shopping bags is one that has yet to become a staple of our collective action in line with our environmental consciousness. There is more than enough, dare I say evidence, to the environmental harm and destruction plastic bags have done, and are doing, contemporarily, even if camouflaged by their “practical” use. 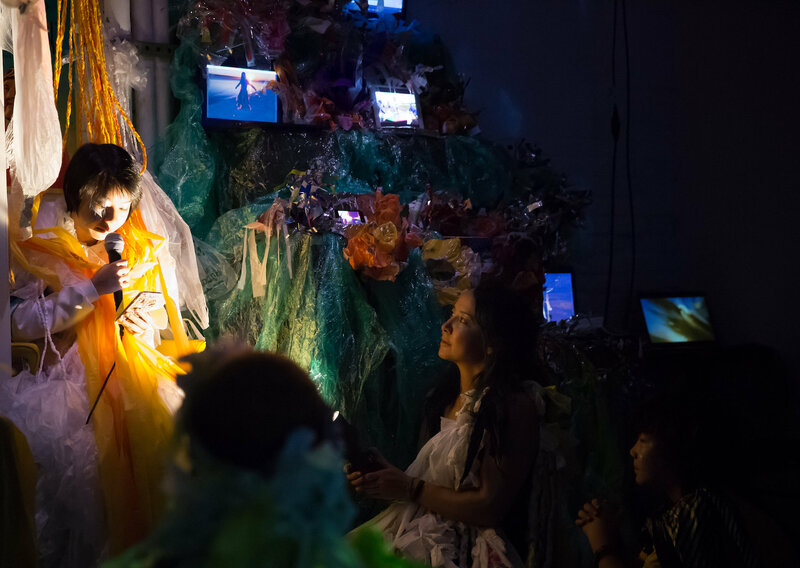 Maura Nguyen Donohue’s “Drowning Planet/Disposable Bodies” intersects live performance, installation, sound, projections and text in a gripping celebration of our time on this earth. 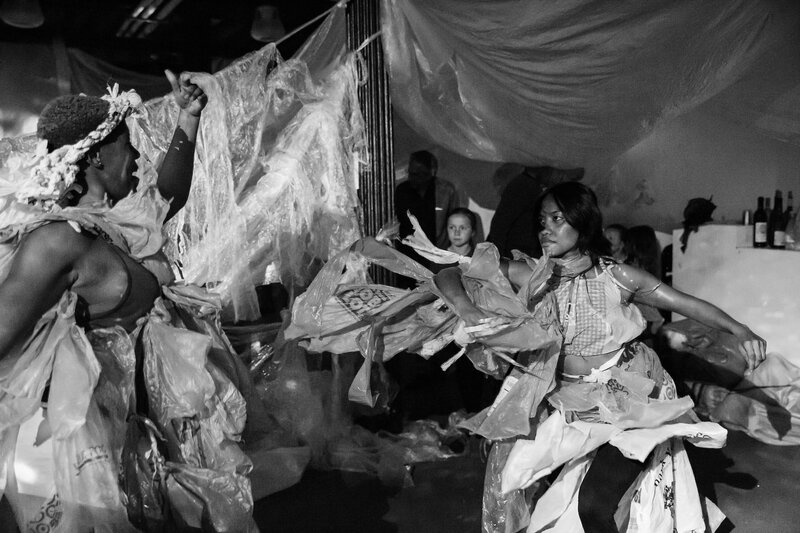 In a sadly too short piece, approximately 40 minutes, audience members walk into a lower level space at La MaMa that has been transformed into an installation environment where all are immersed in a world of (or sea of) plastic bags that’s more than enough for anyone to have nightmares for days on end. Upon entering “Tides Project: Drowning Planet/Disposable Bodies” you find yourself in a strange mix of enchantment and horror as the space and the performers (Donohue, Peggy Cheng, Rina Espiritu, Kirsten Flores-Davis, Adam Cuthbert, Joe Tucker, Luis Angel Grande Corona, and Perry, Peter, Jet & Sasa Yung) are laced, dressed and decorated in an array of all types of plastic bags in a literal underworld where the only water we see is projected onto computer screens of videos of the performers in rituals of mourning and celebration in and around domestic and international bodies of water. There is live music, words and phrases whispered in your ear or loudly proclaimed (i.e. “All the water in the world is all the water in the world”). Libations are offered from a bartendered bar as one is exposed to a world of fun and games in a space overflowing and filled to the gills with plastic. The energy and spirit of the space is one of celebration…but celebrating what? Everything is happening at once. Audience members are seated in observance or moving from place to place. Interestingly, there is a sense of methodology to this performance madness. Although there is no linear through-line to this performance/happening, much of space resembles a place of worship with designated areas of sacredness. Or areas that should be sacred. Like our planet. It is striking how the only images we see of our natural planet, namely our shorelines, are projected on computer screens. Many computer screens. And while everyone is mingling together, live music is playing, whispering and announcements, around the seeming stations of the cross, with computers spewn throughout the basement, one begins to feel there is an underside to the hullabaloo. You do not hear declamations against plastic bags, the use of plastic bags, the state of our environment, nor are we exposed to these corresponding images. It would have been more than easy to project images of our waters and shores strangled with plastic bags and bottles, birds and fish killed or destroyed and the general pollution of our earth with all types of plastic. But we don’t see any of this. Instead, we find ourselves amidst a ritual, or rituals, of celebration that masks the human toll on our environment. And here is where one begins to realize why performance/art-making/activism can be wed. Ms. Donohue and company have brilliantly composed an experience that intentionally censors us from the images of plastic waste, not to hide it from us, but rather for us feel it. At a certain point a young child (Sasa Yung) all clad and covered by plastic, recites what I would refer to as a creation myth, and then the audience is invited to “swim” in a sea of plastic to celebrate what is not in the space….water. There is a sense of glee seeing how people gave themselves the permission to play along with the performers and flock in a sea of imaginary water while covered or flinging plastic bags to everyone’s delight. But what I found ingenious and poignant is how conscious I became in considering how we were all overcome with the reality of being taken over by plastic in the basement space of La MaMa. In place of being exposed to the obvious critiques of the everyday use of plastic bags, I became more aware of the miracle of humans and human invention, both the good and the not so good, like plastic. And more to the point, directing our attention to all the commotion in the space, to the performers, the strangers in the room called the audience, and I found I was afforded the opportunity to imagine something I don’t often do…to consider the state of our world. The “celebratory mourning” we were all participating in was aimed at something we are purposefully responsible for, the care and nurturing of a planet we are intentionally or not, destroying. The human tide of existence in 2017 is bending towards annihilation. The oral history presented by the young child in the telling of the creation myth becomes a performance of memory, couched within the hope of restorative justice, as we are brought back to a place where we can all be seated together listening to a story, hold that space together, in an act that honors our planet and our life on it. Maura Nguyen Donohue has been making and performing experimental performance works in NYC since 1995. She has been a member of La MaMa’s Great Jones Rep since 1997. From '99-04, as artistic advisor for DTW’s Mekong Project, she facilitated residencies in the US and SE Asia. She's currently serves on the board of Movement Research and on the Bessies Committee. Her essay "Ambivalent Selves: The Asian Female Body in American Concert Dance" was published in Contemporary Directions in Asian American Dance. She is Associate Professor at Hunter College, faculty fellow for the Roosevelt House Public Policy Institute, and is the mother of 2.